Poodles do well with basic dog obedience training and in obedience work. They seem to have natural skills. Poodles are smart, they love attention, and they want to please their owners. Puppies up to 6 months of age learn the fastest, and obedience training helps your pup grow up to be well adjusted and good mannered. Dog obedience puppy training is for puppies 6 months of age and younger. Patience is very important here. It's also important to know your pet's personality, and keep it in mind throughout training. 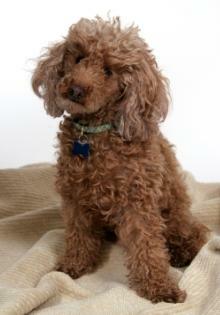 Dogs older than 6 months also learn just about as quickly as the young poodle pups do. 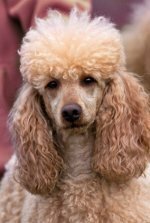 There are obedience competitions and trials throughout the country which allow your poodle to obtain different obedience titles that show your pet has learned difficult commands. They are usually held at dog shows where you can also find dog obedience training tips and information. 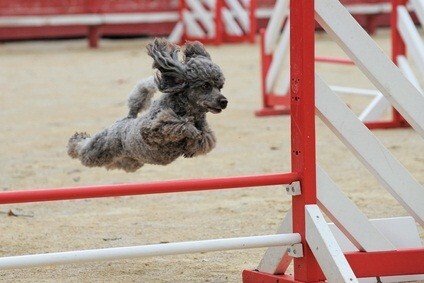 Poodles must have all their shots to enroll in obedience class. Obedience classes are good for us poodle owners, too. You can teach him good manners, and learn why he behaves the way he does. It's useful for socializing your poodle to other dogs and people, too. Knowing why he does something and how he does it allows you to communicate with your pooch, recognize how he communicates with you and understand his communications. Check with your local animal shelter, kennel, pet supply store or your vet's office to find where you can enroll in obedience classes. Obedience exercises judging and rules are stricter than the Canine Good Citizen and rally events but the exercises are similar. There are 4 levels - companion dog (Novice level), companion dog excellent (Open level), utility dog and utility dog excellent (Advanced levels). The exercise level increases with each level. Your pet must earn a score of 170 to get a qualifying ribbon with 3 judges and earn 50% or more of the points in each exercise. Points range from 20 to 40. The obedience championship requires 100 points in different classes. Basic dog obedience training helps to socialize and exercise your poodle along with teaching him skills he'll use throughout his life. Poodle owners can bond with their poodles in a social environment.